The Foundation for Global Sport Development’s prestigious award is accompanied by a $10,000 grant for athletes to continue their volunteer and community service efforts. This week kicks off the nomination round for the 2015 Athletes in Excellence Award, presented by The Foundation for Global Sports Development. Through August 31, 2015, the foundation is accepting nominations to recognize exceptional athletes who are committed to upholding the values of fair play, sportsmanship, education, and drug-free competition in the world of sports. The prestigious award, which is accompanied by a $10,000 grant, honors competing and retired athletes in the United States and abroad who have been role models, leaders, and champions in sport and in their communities. Selected athletes will have demonstrated a commitment to service through exceptionally high levels of volunteerism, mentorship, and advocacy. GSD is committed to continuously supporting programs and initiatives that celebrate the athletes who do so much to inspire youth from around the world. For further details on the award and submission instructions, please visit our Athletes in Excellence Award page. Each summer kids and families flock to nearby pools and waterparks to enjoy the cool water and a break from the heat. With drowning as the second leading cause of death for children between the ages of 1 and 14, we all need to be aware of steps to prevent drowning. Trained lifeguards and vigilant adults are just two of the many elements in drowning prevention. “Drowning does not look like drowning.” We’ve all heard this, but what does it mean? To prevent drowning, we must understand the behaviors exhibited by a person in distress. Many untrained adults may expect a child to intentionally signal they are drowning, but that is rarely the case. Knowing the “Instinctive Drowning Response” can help differentiate between a child who is playing and a child who needs to be rescued. 1. Contrary to some movie portrayals of drowning, people often do not shout for help. Drowning is quiet and quick. 2. While a person who is drowning may flail their arms as they try to stay above water, they will not necessarily wave their arms intentionally to signal for help. 3. As their arms are moving in the lateral position, a drowning person’s head will alternate between being under water and above water. During the brief periods they are above water, the person will typically inhale and exhale as rapidly as they can. A risk here is that they will continue inhaling as their head goes back into the water, thus taking in water. 4. Drowning people typically remain upright in the water, as opposed to on their back, with no sign of a kicking “doggie paddle” motion to assist them. Whether your family is headed to a day at the pool or the beach, many simple steps can be taken to protect you and your children from drowning. 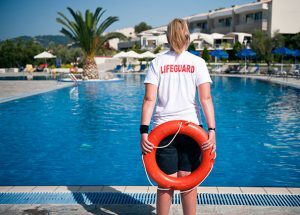 Acquainting yourself and your family with the lifeguard and pool rules are two easy and important steps to prevent drowning. 1. Learn how to swim – Even if your child only knows how to doggie paddle or float, equipping them with the skills to keep themselves safe in the water could save their life. Also, the more knowledgeable the child feels, the less likely they are to panic during aquatic distress. 2. Visit pools with trained lifeguards – Spending the few extra dollars to swim at a pool or beach that is monitored by a trained lifeguard could prove invaluable. 3. Alert the Lifeguard – If your child is not a strong swimmer, it is vital you share that information with the lifeguard. An extra step would be to introduce your child and the lifeguard so they can recognize each other. 4. Teach your children to follow pool rules – Does your child know how to respond to whistles? Does your child know deep-end or diving board etiquette? Ensure both you and your children understand all of the rules of the pool or beach. 5. Flotation devices – Always wear a lifejacket, especially as required by local laws, but do not rely on Personal Flotation Devices (PFDs) as the only form of drowning prevention. 6. Recognize tiredness in children – After a long day of swimming, children can become exhausted faster than they realize. Their bodies may not respond appropriately to any aquatic distress they find themselves in. 7. Be aware of any physical hazards in the pool, lake, beach, or river – Partially hidden logs, broken pool ladders, etc. can catch swimmers by surprise. Obey any posted signs regarding beach or pool closures, as they may be a result of hidden hazards. 8. Pool Safety at Home – If you have a pool at a home, following simple protocols can prevent drowning accidents. Remove toys from the pool when they are not in use, so children do not try to retrieve them. Fence your pool in, and add a sound alarm to any pool gate. Keep emergency equipment, such as a safety ring and rope, near the pool at all times. 9. Receive training – While your best bet is always to call 9-1-1 in the event of an aquatic emergency, knowing CPR and First Aid yourself could be helpful. Take a class on aquatic safety. Scholarship winners will receive $5,000 to offset college tuition and expenses. Los Angeles, California – June 16, 2015 – The Foundation for Global Sports Development is pleased to announce the winners of their inaugural Exceptional Youth Scholarship Award. Launched this year, the scholarship was created to recognize deserving high school students whose academic and extracurricular achievements surpass standard expectations. Scholarship recipients have been awarded $5,000 to be used towards their 2015-2016 tuition and expenses at a four-year university or college. To learn more about the Exceptional Youth Scholarship and The Foundation for Global Sports Development, please visit their website at www.GlobalSportsDevelopment.org. Tryouts can conjure up a variety of feelings for young athletes. Some relish in the chance to show off their skills to coaches and teammates while others might feel apprehensive—scared of being under the microscope or ultimately being cut from the team. Coaches have a role in providing a tryout experience that does what youth sports should do in general – provide an opportunity for young athletes to test and learn about themselves in a positive atmosphere. Athletes with tryout anxiety can set themselves up to feel more in control of their experience by first, having a better understanding of anxiety and second, practicing techniques to calm its negative side effects. Coaches can do their part by having a proactive approach to conducting tryouts and following a list of best practices that will help kids have a good, lesson-filled experience no matter the outcome. According to Barlow (2002), anxiety is an unpleasant inner state in which we anticipate something bad happening that is not entirely predictable from our current circumstances. Anxiety is then, a blend of physiological, behavioral and cognitive components. Catherine Robertson and Gobinder Gill, researchers for www.believeperform.com outline two main types of anxiety, trait and state. Trait anxiety relates to a trait that some of us are born with, an aspect of our personality. State anxiety is short-term anxiety, which comes in response to a specific situation. Both types of anxieties can have somatic (physical) and cognitive (mental) symptoms attributed to them including, sweaty palms and an elevated heart rate (somatic) or negative thoughts like anger and disappointment (cognitive). The first step to controlling anxiety about tryouts, or any other competition, is identifying and labeling thoughts and feelings related to high levels of anxiety, says Robertson. When athletes are able to label their feelings, they can discover for themselves that their symptoms are a signal that they are prepared for competition, rather than necessarily preparing them for something bad to happen. One way for athletes to label their feelings is to assign them a traffic light color. The color green is assigned to happiness, feeling stress-free and thinking clearly. Yellow indicates some stress or anxiousness where thoughts are starting to become affected. Red means a loss of emotional control with irrational thoughts, feelings of anger, frustration or disappointment. When athletes asses themselves and realize they’re in yellow or red, there are several strategies they can use to get back to green. Both Robertson and Gill suggest the following methods to help athletes control anxiety and its negative side effects. Relaxation Training – routines that help the body and mind relax. Relaxation training can come in the form of Yoga or Pilates or simple mediation to music. Breathing Exercises – a strategy that can increase levels of oxygen in the blood, helping the athlete relax and facilitate the working muscles. This practice usually needs to be practiced over time for it to be effective. Goal Setting – a simple, useful technique that gives athletes something to focus on other than their feelings of anxiety. Goals provide meaningful direction to thoughts that might want to run amuck. These goals should be process related and not focus on whole outcomes. Positive Self-Talk – positive affirmations that support cognition. All athletes should practice positive self-talk regularly. It can reduce anxiety by directing the brain to support performance. Emotional Control – when an athlete understands their own performance levels (like being able to label them green, yellow or red as mentioned above) and can then adjust their feelings and thoughts to get where they need to be to compete well. Coaches may or may not have the chance to impart this wisdom on athletes before tryouts, but parents can certainly try to queue into their children’s emotional state as tryouts approach and initiate a conversation, first about teaching the child how to identify their anxiety level and then about techniques for adjusting it. Coaches can encourage a positive experience by initiating tryout best practices. The Positive Coaching Alliance provides resources for coaches conducting tryouts in both a school and sports organization setting. Remember that school tryouts might be the first time players face the possibility of being cut. Coaches should recognize that many may be nervous and do what’s possible to help them relax. At the very beginning, coaches should assemble everyone and explain how the tryout will work, let athletes ask questions along the way if needed. Coaches should explain what they’re looking for, including different skills or physical attributes for each position, general athleticism and a strong effort. Coaches should treat players as equally as possible, especially when it comes to using their names or giving them a certain number of repetitions in a drill. Players recognize when a coach already knows an athlete’s name and then refers to everyone else by their number, for instance. It’s a good idea to ease into competitive drills to give the less skilled athletes some confidence. This will reduce the chance of someone having a humiliating experience. It doesn’t cost much time and as the drill adds difficulty, a trained eye will be able to see more skilled, competitive players rise to the top. Create a variety of competitive environments to go beyond assessing only athletic ability. Test what kind of team player an athlete will be. Find out how someone will respond to a bad call. Assess non-skill attributes, perhaps with a game not directly related to the sport. It’s best to make as few cuts as possible. Making a positive impact on youth is the priority, so the more the better, but a line must be drawn somewhere. Keep those who will contribute, learn and grow in the program, while making sure the number is manageable. When cuts are necessary, post a team list someplace where all the athletes have a chance to see it without their peers watching, like on a website or in an email. Coaches should have a one-on-one conversation with those cut so that the athlete’s effort can be acknowledged and they can receive feedback for next time. The preparation for a sports organization tryout differs slightly since the tryout is conducted outside of school and there are several teams to which a player can be assigned. Some leagues have considered replacing the word “tryout” with “skills assessment,” especially if no one will be cut. Since parents are often slightly more involved in tryouts that happen outside of school, coaches should assemble all parents and players at the beginning to introduce everyone to tryout procedures. There may be occasion for more stations and skill assessments at a sports organization tryout, so the coach or assistant should reassemble at the beginning of each station to explain what’s next and encourage questions. Like with school tryouts, coaches should be perceived as treating players as equally as possible by having everyone wear a nametag or number – everyone notices when a coach knows the first names of only the two best players. Lastly, it’s important to make the tryout as simple as possible. Coaches should have stations labeled or numbered and all athletes should know the names of every coach and assistant so that questions can be asked easily. Provided with just a few simple tools, athletes and coaches can lower the level of anxiety felt around tryouts. With an easy self-awareness assessment method at their fingertips, athletes can practice adjusting their anxiety level to something manageable for their performance. Coaches can help ease anxiety by following some best practices that improve communication around tryouts and helps each athlete feel prepared and valued. When both coaches and athletes put a little extra effort in, everyone can have a good experience. Barlow, D.H. (2002). Anxiety and its disorders: The nature and treatment of anxiety and panic (2nd Edn). New York: Guildford.